To steal a phrase from Joe Bob, last Thursday Cap finally got to say, “Time to take Dragonfly down off the blocks and dunk her in the drink." Watch the video at right to see how Dragonfly gets into the water. Rolling boat lift, Batman! 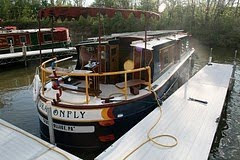 When our canal boat Dragonfly cruised America's Great Loop eight years ago, she had a unique hybrid diesel-electric propulsion system, designed by the Cap'n. Thanks to the custom system he built, we could switch between power sources, using either the 60 HP Yanmar diesel engine (original to the boat) OR the electric motor (installed by Bill) to turn the prop shaft. Electrifying news: For our Canada cruise this summer, SlowBoat will be propelled through the waves by electricity alone. 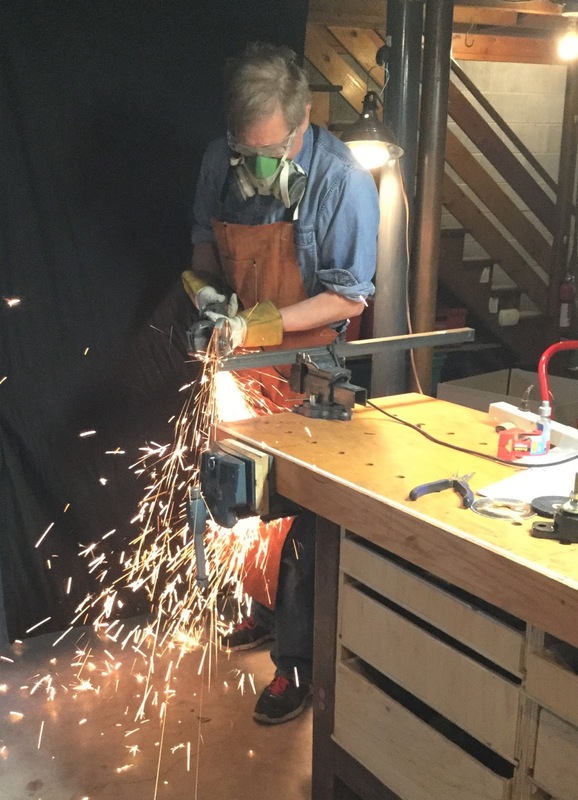 Down in the basement workshop, sparks are currently flying as Cap puts the finishing touches on the new system he's designed. Why ditch the diesel? Yanmar makes a durable engine, but Dragonfly's engine was beyond the normal diesel engine lifespan even before we started that 6,000-mile trip. It was as if we'd set out to drive across America in a car with 700,000 miles on the odometer. Also, old diesel engines tend to leak a little unburned fuel, and that's not super compatible with our eco-friendly goals for sustainable travel. Cap has been puzzling over what to do about the engine for quite a while, weighing the options. Ultimately he decided to jettison the Yanmar engine. He pulled it from the engine room (which is below the stern deck) last fall. 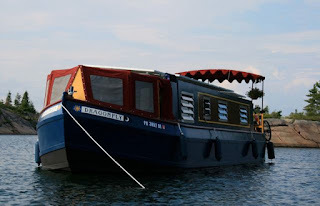 On our Great Loop trip, we cruised on electric power as much as possible, but we were glad to have the engine when conditions were rough, because it had more "oomph" than the 14kw Agni electric motor he had installed. Heavy seas? Strong current? We ran on diesel. 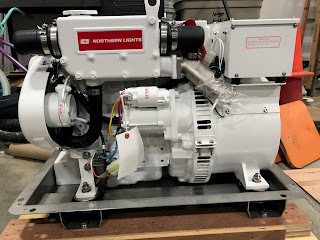 To give us the power we may need for tricky seas, now that the engine is gone, Bill has installed a pair of brand new 14 kw Lynch electric motors (shown at right, installed in the Dragonfly's engine room). He left the original Agni in place, and the three motors will work in concert. 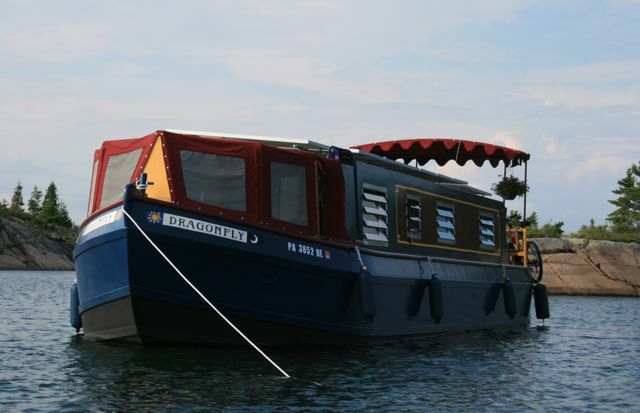 If you are already a SlowBoat fan, you know that the original hybrid propulsion system Bill designed in 2010 included a half-ton bank of batteries that supplied power to the electric motor. The system used eight rooftop solar panels to charge those batteries. This spring, the Cap also updated and expanded the battery bank. For those who like specs, more details coming soon! To be clear, we haven't ENTIRELY said goodbye to diesel fuel. 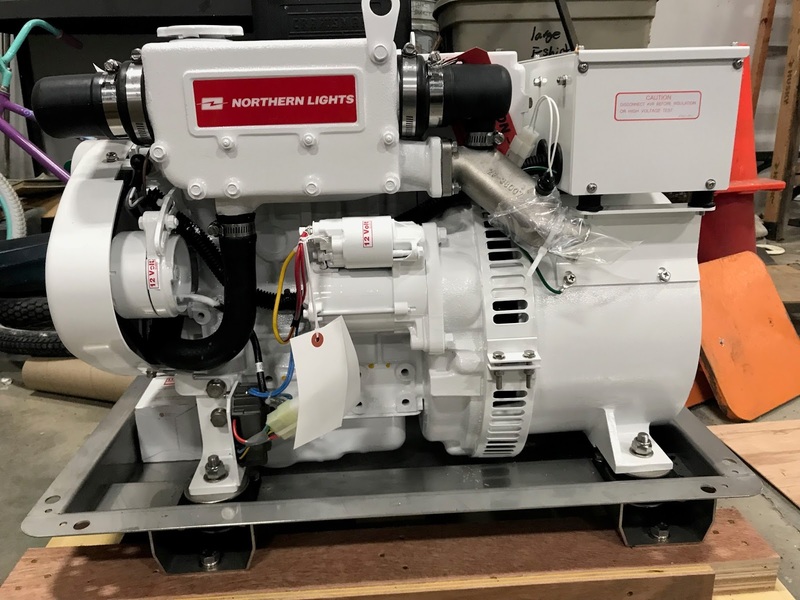 To complement the motor assembly, Bill also installed a spanking new 6kw Northern Lights diesel generator (shown at left). 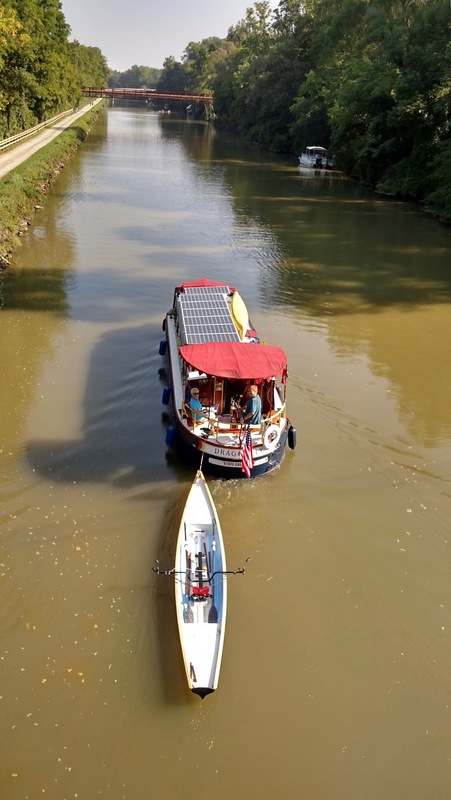 Our goal for the "Little Loop" trip this summer is to run on solar electric as much as possible--same goal as our Great Loop trip. But the gen set gives us (and all the mothers following the blog) peace of mind: If the seas kick up or the wind is howling--and the sun is low and our batteries are drained--we can flip the genny on and charge up the battery bank to keep those electric motors cranking. But Can the Captain Go Water-Skiing? I knew you'd ask. With this spiffy new propulsion system, will SlowBoat go fast? BUT! With this new, more capable system, we expect that our routine cruising speed of 3.5 mph will bump up--just a little. Also, we should be able to cruise longer before we run out of juice. Stay tuned for sea trials! We leave June 1 and aim to cross our wake at the end of August. Starting from our home port of Macedon, New York, about 15 miles southeast of Rochester, here are the key sections and approximate dates. Tomorrow I'll share some details of Dragonfly's innovative new propulsion system.